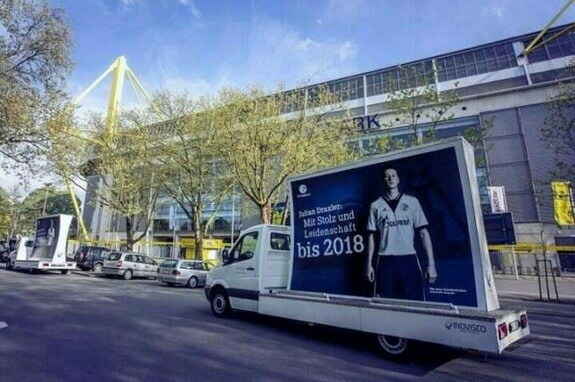 Schalke 04 were so delighted at signing up Julian Draxler to a new contract that they hired a fleet of billboard trucks to tease interested party Borussia Dortmund. Highly rated Draxler had been linked to Dortmund as a replacement for Mario Götze, who is moving to Bayern Munich. But after Schalke extended his contract to 2018, they soon took great delight in reminding their Ruhr Valley rivals that they would not be signing the 19-year-old star. Lorries bearing Draxler's image and the slogan "With pride and passion until 2018 - contract extended" drove through the city, included one special trip to Dortmund's Signal Iduna Park with the specific aim of winding them up.